When speaking about the United Arab Emirates, Canadians often mention Dubai, our most populous city, known for its opulent shopping and the Burj Khalifa (the world’s largest skyscraper), but what is not commonly noted are the many shared values between our two countries, and the strength of our dynamic bilateral relationship. Among our many shared values, we are extremely proud of our commitment to women’s empowerment. Current statistics paint a clear picture of the success of Emirati women. More than 70 per cent of our university graduates are women, approximately 62 per cent of Emirati doctors are women, our speaker of parliament is female, we have nine female cabinet ministers and UAE female business owners lead projects worth more than $14 billion. In the Middle East region, more than 60 per cent of the population is under 30 years old, and it is our responsibility to also make sure their voices are heard. To that end, my government has created a portfolio to represent youth, and appointed Shamma Al Mazrui, the world’s youngest minister, to serve as minister of state youth affairs. She recently visited Canada, and we look forward to bringing UAE and Canadian youth council members together in a joint youth dialogue. In this same spirit of mobilizing the power of youth, the UAE is also actively embracing artificial intelligence (AI) and is quickly becoming a world leader. Not only has the UAE government dedicated an entire strategy to AI, but it has also appointed Omar bin Sultan Al Olama as the world’s first minister of state for artificial intelligence. Also, directly connected to innovation and our vision for the future is our commitment to host EXPO 2020 Dubai, from October 2020 to April 2021. This will be the first time a world’s fair is held in the Middle East and will bring together hundreds of countries, companies, universities and international organizations, to mention just a few sectors. EXPO 2020 will highlight human ingenuity, collaboration and partnership. We sincerely hope the dynamic Canadian brand will be there to showcase its expertise. Another future initiative we look forward to is our Emirates Mars Mission, which will see the launch of a probe into space in 2020, followed by the development of a sustainable city on the planet and sending the first Emirati into space. This past summer, a bilateral MOU on space co-operation was signed between the UAE and the Canadian Space Agency, which includes collaboration on space research and innovation. We are proud of our dynamic bilateral relations with Canada, and the fact that the UAE stands as Canada’s top trading partner in the Middle East and North Africa region. According to Statistics Canada, two-way trade between Canada and the UAE exceeded $1.6 billion in 2017 and reached almost $1.7 billion in 2016. UAE investment in Canada is approximately $30 billion, making the UAE one of Canada’s most significant global investors. Aside from the more than $16 billion of UAE investment in the Canadian oil and gas sector, there has also been significant investment from DP World (Dubai Ports), which manages ports in more than 40 countries, including the Port of Vancouver and the Port of Saint John, N.B. The CEO of Port Saint John, John Quinn, has commented that it’s thanks to DP World that business in the region has reached its highest levels — from increased potash exports to more cruise ships making stops. In regards to the Canadian presence in the UAE, while there are more than 150 Canadian companies, including Tim Hortons, Lululemon, Cirque du Soleil, SNC Lavalin, and Brookfield, to name just a few, and more than 40,000 Canadians who call UAE home, many more business and investment opportunities are available. In addition to more than 45 free trade zones in the UAE, the recently concluded negotiations on a foreign investment promotion and protection agreement between our two countries also allows for more protection for Canadian investors doing business in the UAE. 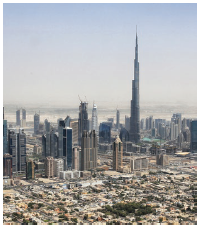 However, perhaps one of the most appealing reasons for doing business in the UAE is its strategic location. With two-thirds of the world’s population living within an eight-hour flight from the UAE, and one third living within a four-hour flight, we are ideally positioned as a regional hub to millions of consumers in the Middle Eastern, African, Asian and Indian markets. It is with enthusiasm that my government and myself look forward to working in collaboration with the various levels of government in Canada, the business community and broader civil society — whether through youth, women or even culturally based organizations and initiatives — and exploring future collaboration for the greater benefit of our two countries. Fahad Saeed Al Raqbani is the ambassador of United Arab Emirates. Reach him at ottawa.emb@mofaic.gov.ae or 613-565-7272.